You may remember back in September when things got kind of quiet on the blog… and I mentioned my daughter’s 1st birthday was coming up. Our sweet little Sadie turned one, right in the middle of our move to Florida. I debated for months whether or not we could swing a birthday party amidst all of the chaos. But a child only has one 1st birthday! And that is definitely something to celebrate! Sadie absolutely loves everything soft, furry and fluffy. So I decided to embrace this and build a theme around her very favorite stuffed animal. Her little lamb. The colors were whites, creams, light caramel and chocolate brown with lots of fluffy, furry, wooly textures. That meant anything and everything lamb related like wool, yarn, felt and fleece with a touch of burlap thrown in. I wanted it to look and feel cuddly soft with lots of different textures for her to touch. Just like her little lamb. Together with good friends, we celebrated this special day with a modern update of an old classic…. Sadie Had a Little Lamb! 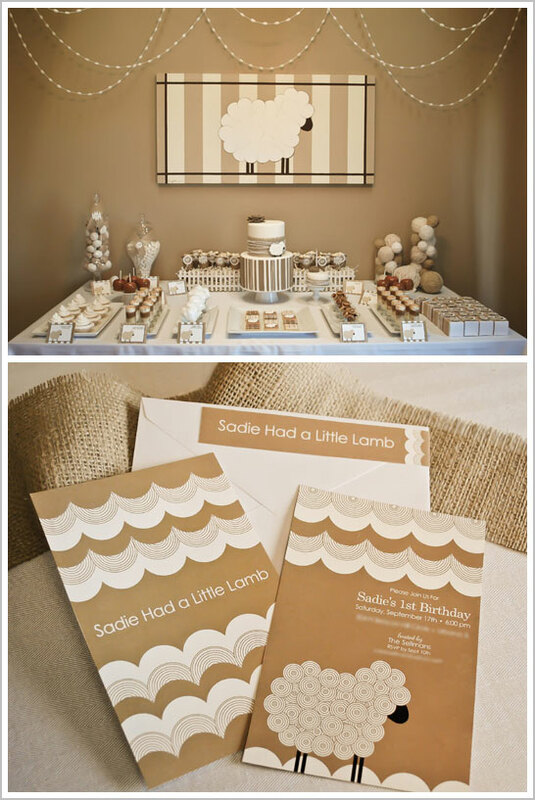 I designed the little lamb invitation to look polished but playful. The lamb’s swirly coat was actually inspired by a wool rug from Crate and Barrel. The back of the invite featured a repeating ‘wool locks’ pattern with the text “Sadie Had a Little Lamb”. I went a bit over the top with the party décor, crafting in every spare moment during the months prior. 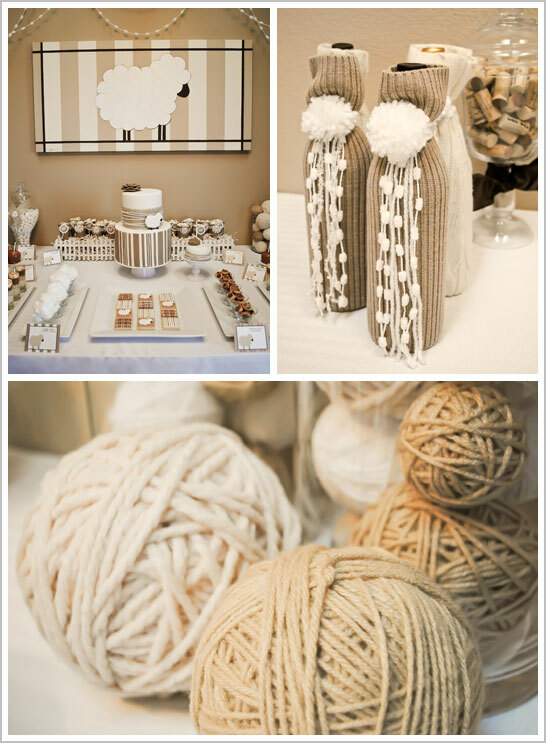 Oodles of yarn was used in the making of this party! 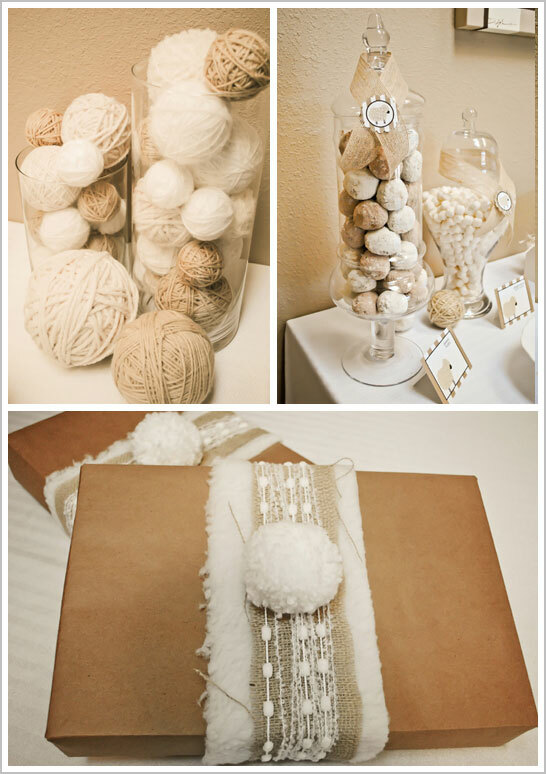 Yarn balls decorated everything from the dessert table to the present table. Small yarn pom poms hung from the ceiling in both the food area and the living room while larger yarn pom ‘flowers’ rested in little white vases. Sadie’s presents were wrapped with furry fleece ribbon and tied with a yarn pom. Yarn wrapped letters spelling ‘Sadie’ marked the present table. And yes, a little bit of yarn even wrapped the cakes. Yarn, yarn, everywhere! 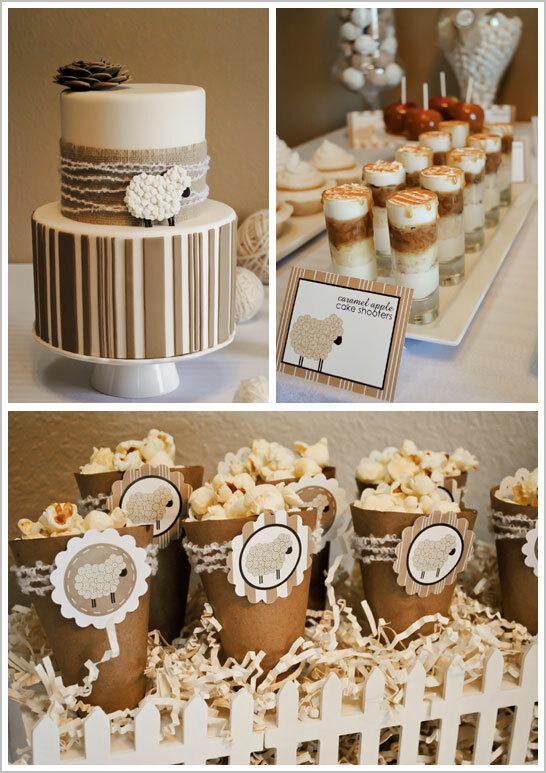 The little lamb theme took over the dessert table. 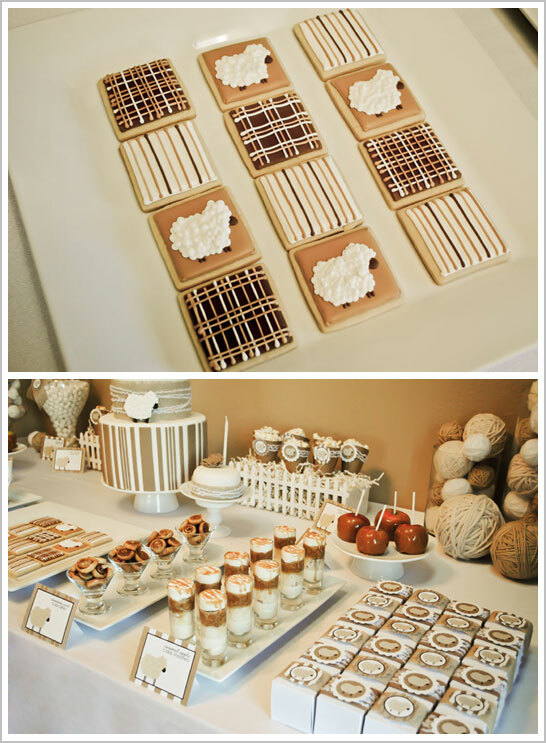 All of the sweets were in the neutral color scheme and appropriate for a Fall. Paper cones adorned with little lamb tags and displayed with a white picket fence were filled with white cheddar popcorn. Fluffy white cotton candy was served up in mini martini glasses as were cinnamon pinwheel cookies (an old Sellman family recipe). Of course, I designed the cakes. One for the centerpiece of the table and a small little smash cake for the birthday girl. Additional desserts included caramel apples, powdered sugar and cinnamon donut holes and caramel apple cake shooters (recipe HERE). We enjoyed food hot off the grill, courtesy of my husband. He felt like such a dad that day! We had tables and chairs set up outside so the kids could run (or crawl) and play. While the kiddos enjoyed their sugar high, the grown ups enjoyed some adult beverages. Even the wine bottles got into the Little Lamb spirit, all dressed up in their matching wool sweater ‘sleeves’. 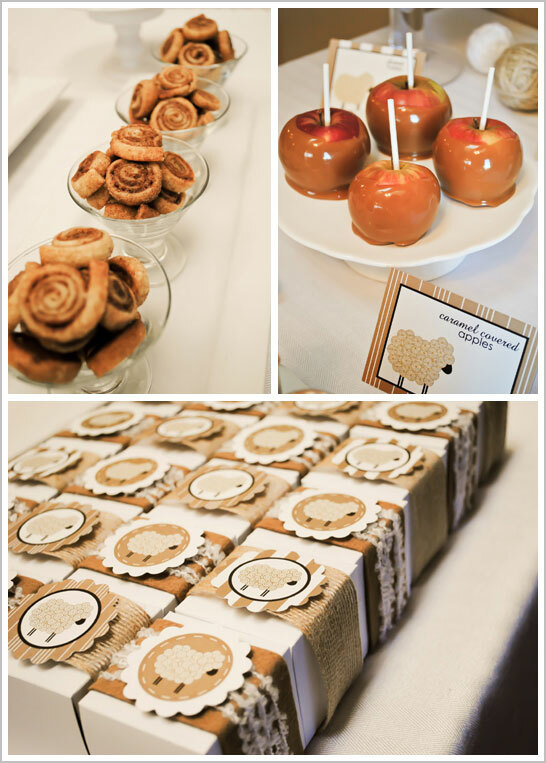 Adorable custom sugar cookies with puffy sheep and mix-n-match patterns were created by Sandy at Firefly Confections. These cute little guys were gone quick! They were SO good! The birthday girl had her very own smash cake to dig into. Talk about my favorite cake moment ever! My sweet little Sadie having her first taste of cake… her hands and face were covered in icing but she loved it! Sara at Bugaboo Bliss made the most adorable custom bib and matching headband using all of the fabrics and colors from the party. By the end, it was covered in cake too! 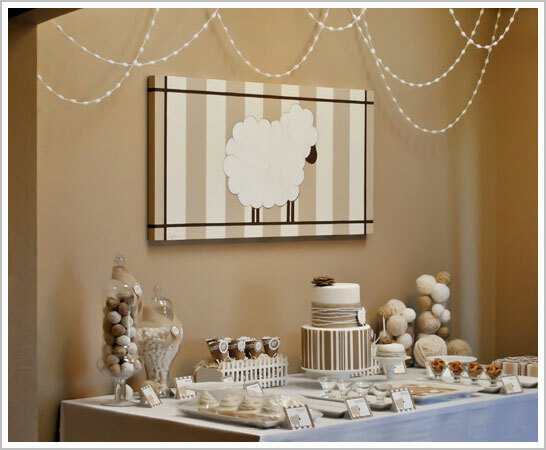 Even though I’m a sweets girl, my favorite part of the dessert table was the little lamb canvas backdrop. Diana of djDecor created this lamb painting for the party and I absolutely fell in love with it! 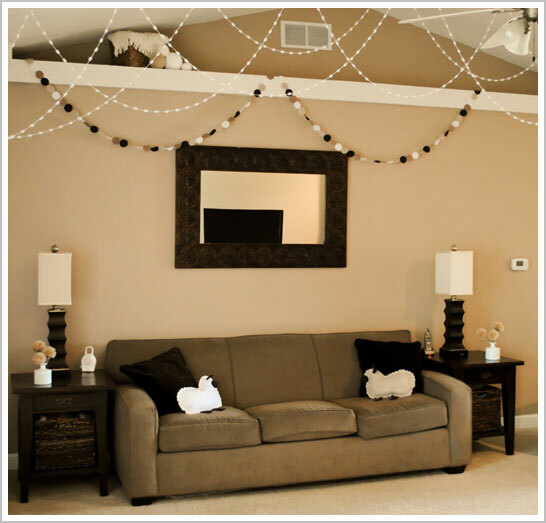 I was so sad to take it down after the party that I decided to change Sadie’s bedroom to a little lamb theme. By far the cutest felt detail had to be the sheep pillows that Sadie’s grandmother made, which matched the sheep décor so perfectly. Thanks for helping, Grammy! 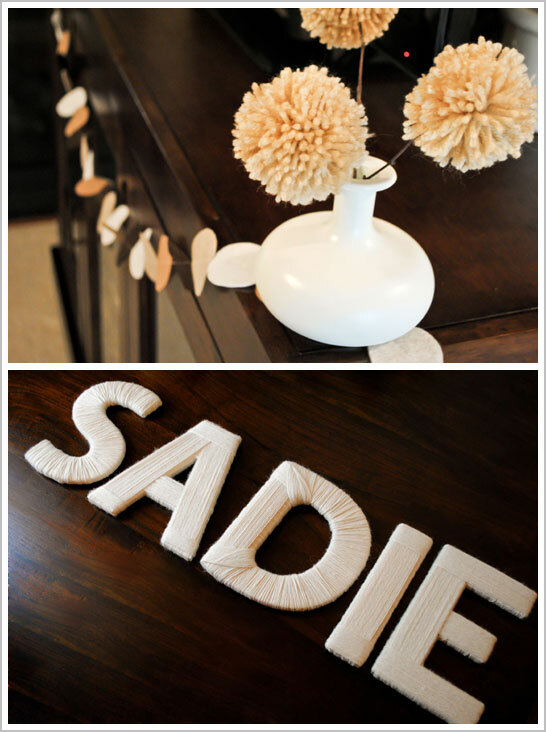 Garland made from small felt circles hung from the ceilings and also wrapped Sadie’s high chair. With the help of a patient husband, Sadie’s grandmother, several talented friends and lots of coffee… somehow we managed to pull this off! And I have to say that it’s my favorite party ever. Not because of the decorations, or the theme, or the cake. But because it celebrated the first year of my sweet Sadie’s life. She is such a blessing and I could not be more grateful to have her in my life. 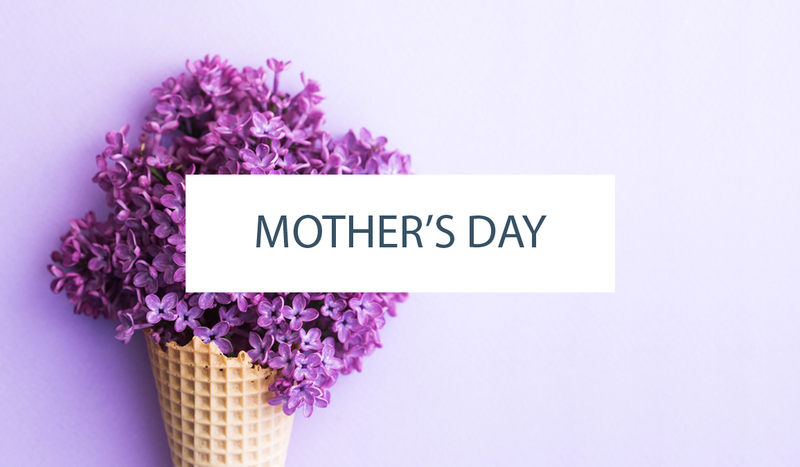 I only hope that she will tolerate having a crazy cake lady for a mother! Thank you, thank you to the lovely ladies who helped me bring this party to life! It was such a special day for our family. I hope all of you like Sadie’s Little Lamb 1st Birthday Party as much as we did! 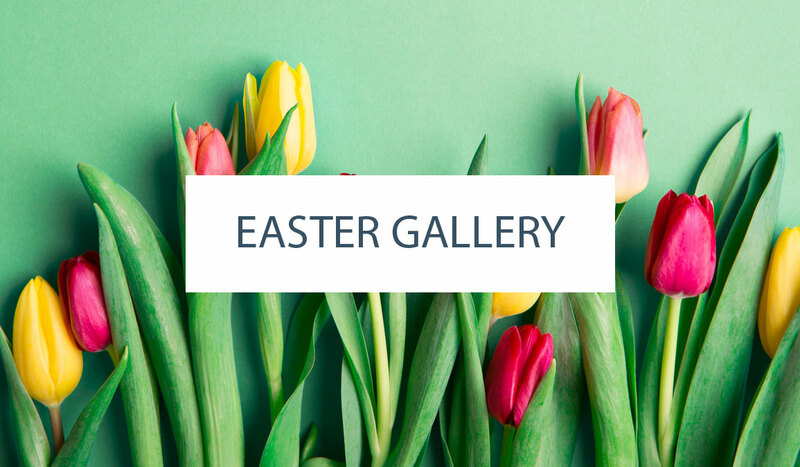 Absolutely amazing – every last detail! The backdrop and how you did her name up is so wonderful. 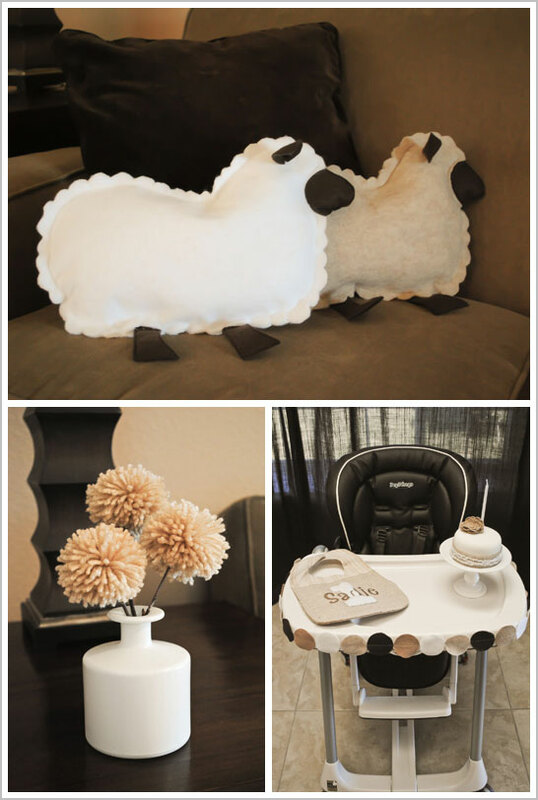 I love the theme, my 4.5 month old also loves her sheep decor. You inspire me with every single post! Amazing! What a beautiful party!! Love the monochromatic scheme! Beautiful job! I am flat out impressed! There isn’t a HINT of something seen before at some other party…bravo!! Unique!! LOVE it! just gorgeous! i love it!! Absolutely beautiful! I can’t believe the level of detail and such amazing coordination. It’s art! Love, Love, Love! Soo adorable, so elegant and so much attention to detail. Well done!! I am in awe. Beyond gorgeous!!!! Carrie, you’ve outdone yourself!! 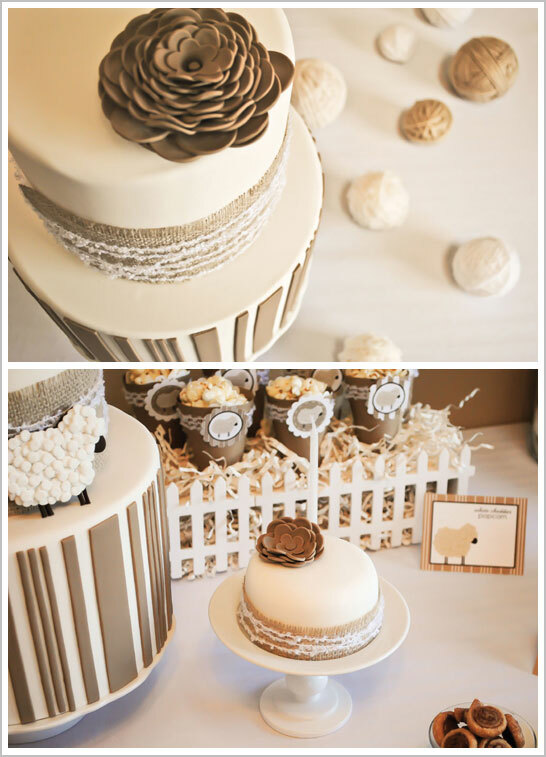 I love the taupe colors!! STUNNING!! So many delicate and lovingly handmade details! In awe! The theme is ridiculously cute! So ridiculous that I want it for my 40th birthday party next year!! And the cake, really! I have seen my fair share of them but this one is brillant in all its simpliticy….PLEASE! More pictures of the cake..Please! Carrie, this is stunnning. I love the color palette and every single detail! too perfect! stylish and clean as always!! Adorable!!! The colors are wonderful. Love the varying shades of brown, such a nice change from traditional pink. 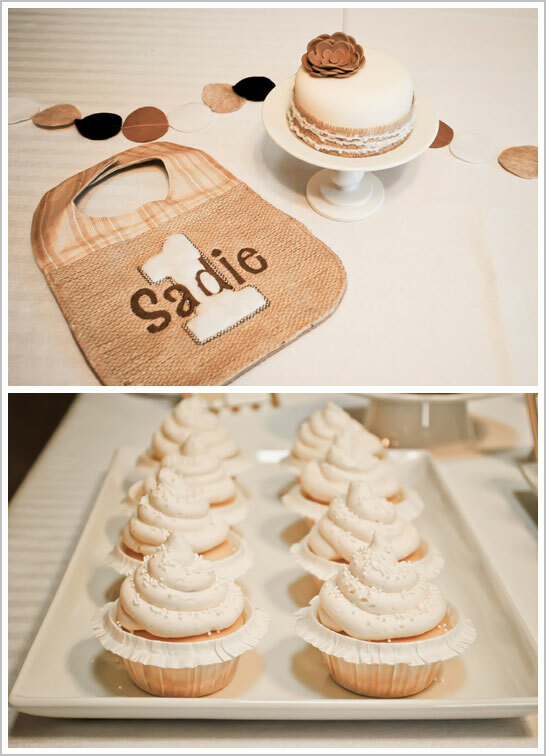 Every last detail is perfect…way to go Mom, I’m sure baby Sadie will love looking at the photo’s of her party in the years to come! right up until I clicked your blog, I thought I was a good mommy, now gonna have to rethink it! hahahaha YOU ROCK! amazing work! What a lucky little girl! What a sweet party for Sadie’s 1st birthday! Everything turned out great! 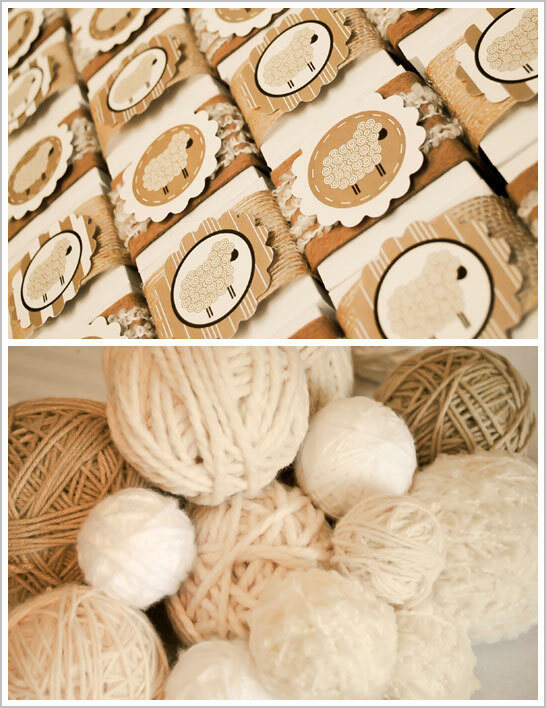 I love the natural colors and all the yarn balls…those must have taken forever to make! All the sweets look delicious as usual, the cake is goregous and I would love to have the recipe for those cinnamon pinwheels! YUM! This party is PERFECT. 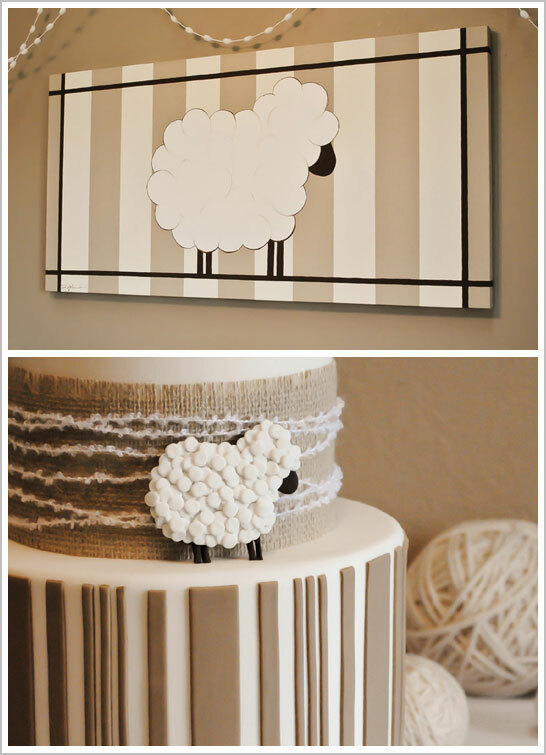 I cannot get over the cake, the yarn name, the sheep pillows and the list could go on and on.. There are no words. PERFECTION. Above perfection. I love every single detail. What a lovely party. Exquisite detail. Happy birthday, Sadie!